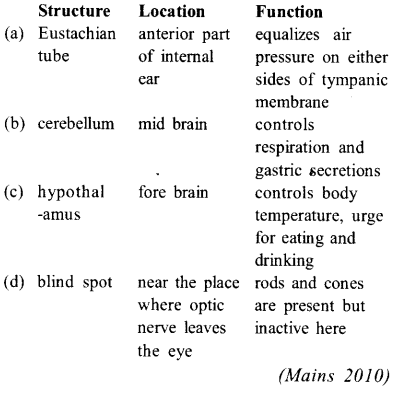 (d) the optic nerve leaves the eye. (d) regulation of body temperature. (a) Retinal is the light absorbing portion of visual photo pigments. 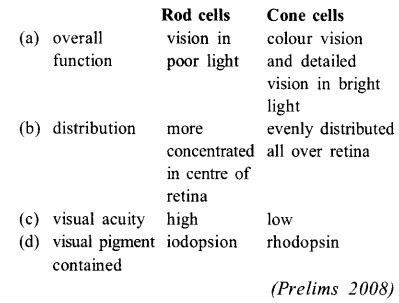 (b) In retina the rods have the photopigment rhodopsin while cones have three different photopigments. (c) Retinal is a derivative of vitamin C.
(d) Rhodopsin is the purplish red protein present in rods only. (a) C-Aqueous chamber-Reflects the light which does not pass through the lens. (b) D – Choroid – Its anterior part forms ciliary body. 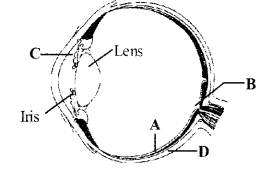 (c) A – Retina – Contains photoreceptors i.e., rods and cones. (d) B – Blind spot-Has only a few reds and cones. (d) comparatively more permeable to K+ ions and nearly impermeable to NA– ions. (d) it has no blood supply. (b) NA– ions from extracel lular fluid to intracelluar fluid . (d) NA– ions from intracellular fluid to extracellular fluid. (d) C : endolymph, D : sensory hair cells, A : serum. 22. Which one of the following is the correct difference between rod cells and cone cells of our retina? (d) proximal end of uriniferous tubules. (d) movement of the neck. (d) NA– out of the cell. (d) covered by myelin sheath. (d) in old age it becomes the cause of cataract. (b) NA+ move inside and K+ move more outside. (d) sympathetic nervous system, voluntary. (d) alter the size of pupil. The anterior horns of spinal cord contains cells with fibres that form the anterior (motor) root end and are essential for the voluntary and reflex activity of muscles they innervate. If the anterior hom motor cells are destroyed, the nerves cannot regenerate and muscles are never useful again. A small oval, yellowish area of the retina lying exactly opposite the centre of the cornea is named the macula lutea or yellow spot which has at its middle a shallow depression, the fovea centralis. 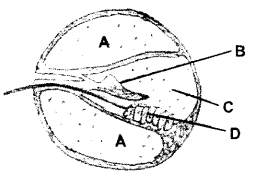 The fovea centralis has cone cells only. It is devoid of rods and blood vessels. The fovea centralis is the place of most distinct vision. Vestibular apparatus is a part of inner ear which is located above the cochlea. It consists of three semicircular canals, which detect movements ofthe head, and the utriculus and sacculus which detect the position of head. It does not play any role in hearing, but is responsible for maintaining the balance of the body and posture. Language comprehension is a function of cerebrum. Cerebellum coordinates and controls rapid muscular activities such as running, typing etc. Although it does not initiate such voluntary movements, but it is an important centre for coordinating movements and for controlling posture and balance. Cerebellum’s function is almost exclusively motor; but it is also implicated in some forms of learning. Hypothalamus lies at the base of the thalamus. It provides anatomical connection between the nervous and endocrine systems by its relationship to the pituitary gland. Hypothalamus is thermoregulatory centre. Hence, it is called “thermostat” of the body. It keeps body temperature at roughly 37°C by means of a complex thermostat system. Any localised injury to hypothalamus will, hence, disrupt regulation of body temperature. Retinal pigment is an aldehyde of vitamin A. In the given figure, A is retina which is the innermost layer, containing photoreceptors rods and cones. B is blind spot. Optic nerves pierce through retina at blind spot. It has no visual cells. C is aqueous humor. It nourishes cornea and lens both of which are avascular. D is sclera. It is the outermost covering and maintains shape of eyeball. It also protects inner layers of the eye. K+ ions predominate in the intracellular fluid whereas Na’ ions predominate in extracellular fluid. Brain is the anterior most part of central nervous system. Human brain can be divided into three parts forebrain, midbrain and hind brain. Human hind brain comprises pons, cerebellum and medulla (also called the medulla oblongata). Vestibular apparatus is a part of inner ear which is located above the choclea. It consists of three semicircular canals, which detect movements ofthe head, and the utriculus and sacculus which detect the position of head. It does not play any role in hearing but is responsible for maintaining the balance of the body and posture, thus necessary. When a neuron is not conducting any impulse, i.e., resting, the axonal membrane is comparatively more permeable to potassium ions (K+) and nearly impermeable to sodium ions (NA+). Hypothalamus is the region of the forebrain in the floor of the third ventricle, linked with the thalamus above and the pituitary gland below. It contains several important centres controlling body temperature, thirst, hunger, and eating, water balance, and sexuaj function. It is also closely connected with emotional activity and sleep and functions as a centre for the integration of hormonal and autonomic nervous activity through its control of the pituitary secretions. Alzheimer’s disease is a neurological disease characterized by progressive loss of intellectual ability. The disease, which is named after German physician Alois Alzheimer (1864-1915), is associated with general shrinkage of the brain tissue, with deposits of (3-amyloid protein and abnormal filaments composed of tau protein in the brain, and changes in the neurotransmitter systems within the brain that include a loss in the activity of cholinergic neurons (neurons releasing acetylcholine). Some inherited forms are associated with a genetic locus on chromosome 21. Hypothalamus is the thermoregulatory center of the body. It keeps body temperature at 37°C by means of a complex thermostat system. Cornea is a transparent portion that forms the anterior one-sixth of the eye ball. The cornea admits and helps to focus light waves as they enter the eye. The cornea is avascular (i.e., has no blood supply). This part of eye absorbs oxygen from the air. The cornea was one of the first organs to be successfully transplanted because it lacks blood vessels. Action potential is the change in electrical potential that occurs across a plasma membrane during the passage of a nerve impulse. As an impulse travels in a wavelike manner along the axon of a nerve, it causes a localized and transient switch in electric potential across the membrane from – 60 mV (millivolts; the resting potential) to + 45 mV. It is due to the fact that the sodium channels open and the potassium channels remain closed. As a result, sodium channels permit the influx of Na+ by diffusion from extracellular fluid to intracellular fluid. Rod cell is a type of light-sensitive receptor cell present in the retina of vertebrates. Rods contain the pigment rhodopsin and are essential for vision in dim light. They are not evenly distributed on the retina, being absent in the fovea and occupying all of the retinal margin. Cone cell is a type of light-sensitive receptor cell, found in the retina of all diurnal vertebrates. Cones are specialized to transmit information about colour and are responsible for the visual acuity of the eye. They function best in bright light. They contain pigment iodopsin. They are not evenly distributed on the retina. Nerve is a strand of tissue comprising many nerve fibres plus supporting tissue enclosed in a connective tissue sheath. The signal that travels along the length of a nerve fibre and is the means by which information is transmitted through the nervous system is called nerve impulse. It is marked by the flow of ions across the membrane of the axon caused by changes in the permeability of the membrane, producing a reduction in potential difference that can be detected as the action potential. The strength of the impulse produced in any nerve fibre is constant. Bowman’s gland, also called olfactory gland is any of the branched tubuloalveolar glands situated in the mucous membrane of the olfactory region of the nasal cavity that produce mucus to moisten the olfactory epithelium and dissolve odour-containing gases. Neurotransmitters are chemicals that are used to relay, amplify and modulate electrical signals between a neuron and another cell. Substances that act as neurotransmitters can be categorized into three major groups (1) amino acids (primarily glutamic acid, GABA, aspartic acid & glycine), (2) peptides (vasopressin, somatostatin, neurotensin, etc. ), and (3) monoamines (norepinephrine, dopamine and serotonin) plus acetylcholine. Cortisone is a glucocorticoid steroid hormone, produced by the adrenal glands and has anti¬inflammatory and immune-system suppressing properties. 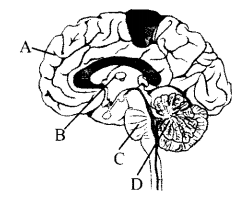 Options (a), (b) and (d) are reflex actions. Autonomic nervous system is involved in peristalsis of intestine which is effected through mysentric plexus. Sympathetic fibres decrease peristaltic movements while parasympathetic fibres increase these movements. Abducens is the sixth cranial nerve which innervates the external rectus muscle of the„eye ball. It is responsible for turning the eye outwards. Movement of the tongue is controlled by the hypoglossal nerve. Neck movements is controlled by the facial nerve. Swallowing is by glossopharyngeal. Parkinsonism is caused by degenerations of neurons in Substantia Nigra tract which are essentially dopaminergic. This striatum controls muscle tones and coordinates movements. An imbalance is caused by deficiency of dopamine (an inhibitory neurotransmitter) vis a vis. Epinephrine (cholinergic which is an excitatory neurotransmitter) results in motor deficits. Hence to restore a balance central anticholinergics are given. Parkinson’s disease is a clinical picture characterized by tremor, rigidity, slowness of movement, and postural instability. The commonest symptom is tremor, which often affects one hand, spreading first to the leg on the same side and then to the other limbs. The patient has an expressionless face, an unmodulated voice, an increasing tendency to stoop, and a shuffling walk. In the resting nerve fibre, in the external medium (tissue fluid), sodium ions (NA–) predominate, whereas within the fibre (intracellular fluid) potassium ions (K+) predominate. Due to different concentrations of ions on the two sides of the membrane, sodium ions tend to passively diffuse into the nerve fibre and potassium ions tend to diffuse out of the nerve fibre down their electrochemical gradients. The membrane of a resting nerve fibre is, however, more permeable to potassium than to sodium. Because of this selective permeability of the membrane, potassium leaves the nerve fibre faster than sodium enters it. This makes the membrane of the resting nerve fibre polarized, extracellular fluid outside it being electropositive (positively charged) with respect to the cell contents inside it. Vagus nerve arises from the side of medulla oblongata. It innervates the larynx, trachea, oesophagus, stomach, lungs, heart and intestines. It is a mixed nerve. It controls the visceral sensations and visceral movements, i.e., heart beat, respiratory movements, peristalsis, sound production, etc. Movement of the tongue is controlled by hypoglossal nerve as it innervates the muscles of the tongue. Cell body of a nerve cell contains basophilic granules called Nissl’s granules. These granules appear to be cistemae of rough endoplasmic reticulum with numerous attached and free ribosomes. They probably synthesize proteins for the cell. At the level of node of Ranvier the myelin sheath is discontinuous but not the neurilemma lining. Actually myelin sheath is an integral part of Schwann’s cell – which form a continuous neurilemmal covering. Each Schwann’s cell wrap-around the neurite to form concentric layers of plasma membrane. But at the level of junction between two Schwann’s cells myelin can not be formed and thus a gap appears. The rod cells of eye contain a purplish pigment called visual purple, or rhodopsin. They function in dim light and at night. Bright light splits rhodopsin into a lipoprotein scotopsin and a carotenoid pigment retinene. The splitting of rhodopsin depolarizes the rod cell. In the dark, rhodopsin is resynthesized from scotopsin and retinene. This process is called “dark adaptation.” It makes the rods functional. It takes some time for rhodopsin to be reformed. This is why on entering a dark room at daytime or on coming out of a well lighted room at night, we feel blind for a while. When we go from darkness into bright light, we feel difficulty in seeing properly for a moment till rhodopsin is bleached and cones become functional. Accomodation is the reflex mechanism by which the focus of the eye changes to make the images of distant and near objects sharp on the retina. Mutation is a change in the genetic material (DNA) of a cell, or the change in a characteristic of an individual, which is not caused by normal genetic processes. Photoperiodism is the response of an organism to the day length. Cornea forms the anterior one-sixth of the fibrous coat. It is transparent, circular and fully visible from infront. It is composed of a peculiar variety of connective tissue covered externally by stratified non- keratinized squamous epithelium and internally by simple squamous epithelium. It lacks blood vessels. It is nourished by lymph from adjacent area. 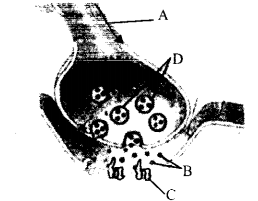 Depolarization of a nerve cell membrane occurs during the passage of an action potential along the axon where the nerve is transmitting an impulse. During depolarization, the activation gates of Na channels open, and the K channels remain closed. NA– rush into the axon. Entry of sodium ions leads to depolarization (reversal of polarity) of the nerve membrane, so that the nerve fibre contents become electropositive with respect to the extracellular fluid. (ii) Maxillary, also sensory branch from skin and mucous membrane of cheeks and upper lip, and from lower eyelids. (iii) Mandibular, a mixed branch innervating the lower jaw, lower lip, pinna and tongue. Vagus nerve is the 10th cranial nerve and innervates larynx, trachea, oesophagus, stomach, lungs, heart and intestines. Facial nerve is the 7th cranial nerve and innervates muscles of face and back, taste buds and salivary glands. Sympathetic nervous system is a component of autonomic nervous system consisting of a pair of sympathetic trunks, preganglionic sympathetic fibres, postganglionic sympathetic fibres and collateral ganglia. It quickens rate and force of heart beat while it inhibits secretion of saliva and gastric juice. Synapse is the close proximity of the axon of one neuron and the dendrite or cyton of another neuron with a gap of just about 200 A in between. A nerve impulse is transmitted across the synapse by the release from the presynaptic membrane of neurotransmitter, which diffuses across the synaptic cleft to the post synaptic membrane. 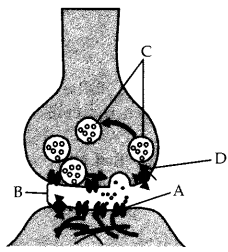 This triggers the propagation of the impulse from the dendrite along the length of the post synaptic neuron. Neurons or nerve cells are the structural and functional unit of nervous system. These have a special structure but vary greatly in size and shape. Each neuron has a cell body which encloses cytoplasm and has a nucleus. A number of processes arise from the cell body. There is usually a single axon and a variable number of dendrites. The medullated nerve fibres is composed of a shining, white, fatty substance called myelin. Photosensitive means sensitive to light. The rod cells of retina contain a purplish pigment called rhodopsin. They function in dim light and at night. Rhodopsin consists of a protein component, opsin, linked to a nonprotein chromophore, retinal (or retinene), a derivative of vitamin A. Light falling on the rod is absorbed by the retinal, which changes its form and separates from the opsin component. This initiates the transmission of a nerve impulse to the brain. Retinol is the another name of vitamin A. Deficiency of this affects the eyes, causing night blindness and xerophthalmia. Melanin is a pigment that gives colour to the eyes, skin and hair in vertebrates. Vagus nerve is the tenth cranial nerve. It arises from the side of medulla oblongata. It innervates the larynx, trachea, oesophagus, stomach, lungs, heart and intestines. It is a mixed nerve. It controls the visceral sensations and visceral movements, i.e., heart beat, respiratory movements, peristalsis, sound production, etc. The blood is supplied into visceral organs by both SNS (sympathetic nervous system) and PNS (parasympathetic nervous system) involuntarily. The sympathetic fibres increase the rate and force of heart beat, constrict most blood vessels and raise the arterial blood pressure. The parasympathetic fibres decrease the rate and force of heart beat, dilate many blood vessels and lower the arterial blood pressure. By training, a particular response can be obtained to a stimulus other than the one which normally evokes that response. Such a reflex is known as the conditioned reflex. The conditioned reflexes were first demonstrated in 1920’s by the Russian physiologist I.P. Pavlov. He found that the sight and smell of food reflexly cause flow of saliva in hungry animals. He rang a bell every time he offered food to a dog. The bell did not induce salivation by itself in the beginning of the experiment. Gradually, the dog learnt to associate the bell with food. Eventually, mere ringing of bell, without presenting food, induced salivation in the dog. Thus, ringing of bell can substitute sight of food to cause salivation. Pavlov called sound of the bell as conditioned stimulus, salivation in response to bell a conditioned response, food itself as unconditioned stimulus, and salivation in response to food an unconditioned response. A conditioned reflex is established when a new sensory clue (the bell) becomes associated with an inborn reflex (salivation). Pupil is the opening which controls the amount of light entering in eye. When light intensity is high, it decrease in size and when light intensity is low it dilates to allow more light in the eye to make eye enable to see the object. A small area of the optical part of the retina lying exactly opposite to the centre of the cornea is called the macula lutea, or yellow spot which has a yellow pigment (xanthophyll). The macula lutea has at its middle a shallow depression, the fovea centralis. The fovea has cone cells only, and is the place of most distinct vision. Away form the fovea, the rod and cone cells occur in equal numbers, and at the periphery of the retina, the rods are more numerous than the cones. This is why we see better in dimlight by looking out of the corner of the eye. The point on the retina from where the optic nerve starts is called the blind spot, or optic disc, as it lacks the receptor cells and is insensitive to light. At the junction of the sclera and the cornea, the vascular coat sharply bends into the cavity of the eyeball to form a thin, coloured partition. This partition is called iris. It is perforated at the middle by an aperture called pupil. The iris contains two sets of smooth muscles sphincters and dilators. These muscles regulate the amount of light entering the eyeball by varying the size of the pupil. The sphincter muscles are arranged in rings. Their contraction makes the pupil smaller in bright light so that less light enters the eye. The dilator muscles are arranged in a radial manner. Their contraction widens the pupil in dim light to let in more light. Iris, by regulating the size of the pupil, allows light to pass only through the centre of the lens, which is optically the most effective part. Afferent nerve fibres carry impulses from the receptors to the central nervous system. Efferent nerve fibres conduct nerve impulses from the central nervous system to the effector organs such as muscles and glands. Vagus nerve is X nerve. It arises from the side of medulla oblongata. It innervates the larynx, trachea, oesophagus, stomach, lungs, heart and intestines. It is a mixed nerve. It controls the visceral sensations and visceral movements, i.e., heart beat, respiratory movements, peristalsis, sound production, etc. Glossopharyngeal is the IX nerve. Facial is the VII nerve and trigeminal is the V nerve. The ventricles consist of four hollow, fluid filled spaces inside the brain. The third ventricle is also known as diacoel. The third ventricle consists of a narrow channel between the hemispheres through the area of the thalamus. It is connected by the cerebral aqueduct or aqueduct of Sylvius or iter in the midbrain portion of the brainstem to the fourth ventricle in the pons and medulla. Metacoel is the IV ventricle, rhinocoel is the I ventricle and paracoel are the II ventricles. The action of the parasympathetic nervous system is opposite to that of the sympathetic nervous system. If the sympathetic nervous system accelerates an action, the parasympathetic nervous system slows it. However, neither system is exclusively exitatory or inhibitory. The parasympathetic fibres constrict the pupil, decrease the rate and force of heart beat, dilate many blood vessels, lower the arterial blood pressure, quicken the peristaltic movements, and contract the urinary bladder. X nerve i.e. the vagus nerve (mixed) that arises from the side of medulla controls the visceral sensations and movements of larynx, lungs, heart, stomach and intestines. IX nerve innervates pharynx and tongue. VIII nerve innervates internal ear and VII nerve innervates face, neck, taste buds and salivary glands. The retina consists of both pigmented layer and the sensory layer. The pigment cells reinforce the light absorbing property of choroid in reducing the scattering of light in the eye. The sensory layer consists of rods and cones required for vision. Bird’s (e.g. vulture) sense of sight has much higher resolution than ours. Their eyes are much larger in proportion to the sizes of their heads than our eyes are.